What are the programming concerns, design concepts, and implementation details of nxml. In this article, we will see answer for the first question. In the next article, we will go in deep to the design and internals of nxml. Load your neural network using nxml to Train it, and run it - and even save the trained network back so that you can use it later. You can understand how to develop and implement an xml language specification for various purposes. You can learn how easily you can create data structures in your project from xsd schemas. You can gain some insights regarding neural network programming and implementation. Just for using Neural XML and to understand these concepts, you don't need to understand a lot about Neural Network Theory or even about BrainNet library. How ever, if you are a beginner (not in programming, but in neural networks), I strongly recommend you to read the Part I and Part II as an introduction, from this blog - because that will provide you a solid foundation to begin neural network programming, and to understand neural network concepts. 2. What is Neural XML? In this part, we will discuss what exactly is Neural XML, and how to use it. As you already know, a neural network consists of various layers, and each layer has a number of neurons in it. Initially, we will train the neural network, by providing the inputs to the input neurons, and by providing the output to the output neurons. Once the neural network is trained, you can run it. Let us see how to begin with neural xml. Where to get Neural XML? The binaries for nxml, and images and other files required for this article, is available. 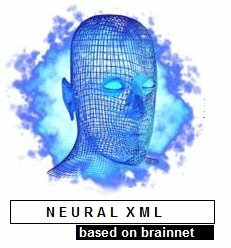 The full source code of Neural XML, and BrainNet Neural Network library is available. See this article about Neural Networks and Brain Net library. Download the project, and build it. Add Neural XML bin folder to your path, so that you can run nxml in command prompt from any where. Step 2: Run NXML and have a look at it. Run nxml tool from the command prompt. If you run nxml with out any parameters, it will give you the following message. Use the -start switch to train an run a network using an nxml file. The above example will create a network with 3 layers - 10 neurons in input layer, 10 neurons in hidden layer, and 4 neurons in output layer. The above example will create a network with 4 layers - 3 neurons in input layer, 3 neurons in first hidden layer, 3 neurons in second hidden layer, and 2 neurons in output layer. I think this will give you a fair understanding regarding how to use nxml command line tool. Anyway, let us dig in to the matter a little deeper. Now, an interesting example. Let us see how we can create a 2-2-1 neural network (2 neurons in input layer, 2 neurons in hidden layer, and 1 neuron in output layer) to represent a digital gate (like and AND gate, or OR gate), using NXML. Then, we will train our 2-2-1 network to perform functions like AND, OR, XOR etc. See the previous articles for more information about neural networks (read them here Part I and Part II). If you examine my previous article, you can see that how we did this earlier, but using .NET code. This time we are doing the same - but using our own language, that is NXML. Let us see how to do this. As the first parameter, we will pass the number of neurons in each layer, separated with commas. In this case, it is 2,2,1 - i.e, 2 input neurons, 2 hidden layer neurons and 1 output neuron. The second parameter is the file name. <html> <head> </head> If you open and examine the gate.xml file generated by nxml, you will see the following information. Under the root tag 'Network', there are various 'Layer' tags. As you can see, the network consists of three layers, Layer0, Layer1 and Layer2. Layer0 consists of two neurons L0N0 (0th neuron in 0th layer) and L0N1 (1st neuron in 0th layer) and so on. Now, just have the look at the neuron L1N0 (0th Neuron in Layer1). You can see a tag 'Connections' - which define which all neurons in previous layer is connected to this neuron.<html> Please note that each connection input holds a 'weight'. The above code, to train the network, is written according to the nxml specifications. Kindly see this brief introduction to NXML language. NXML language is pretty straight forward. To perform an action on a neural network, you should load it initially. Using NXML, you can specify which network to load, what operation to perform on the network, etc. The 'Network' tag is used to load an xml file from disk, like the one we generated earlier. The 'DataBlock' tag specifies which operation we should perform on the network. For example, the following line specifies that the gate.xml should be loaded, and it should be saved as OR.xml after performing the operations. The Network tag has the following attributes. SavePath - You can save the network to a new file path. It has the following attributes. TrainCount - The number of times the operation should be performed. It is not required if Type attribute is Run. Also, a data block holds the data which should be used to train the network. For e.g., In our above example, the first data block holds data equivalent to an OR truth table. Data inside a Data block can be either PatternData or ImageData. We are using PatternData here. Use of ImageData tag will be explained later. InputType - species the format that we provide as input. Input Type can be Pattern, Array, Number and Character. InputValue - Input value represents the value we provide for as input to the neural network. This will be parsed based on the InputType. For example, if Input Type is 'Pattern', then then each bit in the input value is fed directly to the neurons in the input layer. For example, in the following case, 1 and 1 will be input to the neurons in first layer, and 0 is the target output for the first neuron in output layer. If you want the values in decimal format (single), provide Array as the input or output type. If you are using input type as character, you should need at least 8 neurons in input layer - because a character requires 8 bits to represent it. OutputValue tag is not considered, and the value over written, if the data block type which holds this pattern data is 'Run' instead of 'Train'. As another example, let us check some valid inputs for a 3-3-2 neural network with 3 neurons in input layer, and 2 neurons in output layer. Now, to train the neural network, we can invoke the nxml interpreter using the following command, in the command prompt. This causes the nxml interpreter to process trainGate.n.xml. This will interpret the three 'Network' tags, and the following files are generated - i.e, OR.xml, AND.xml and XOR.xml, (as specified in trainGate.n.xml). Have a look at these XML files, and see the change of values in connection weights, bias etc. Now we have three trained neural networks. OR.xml which can perform functions of an OR gate, AND.xml which can perform functions of an AND gate and XOR.xml which can perform functions of an XOR gate. Let us see how to 'run' these networks. Let us create a file, runGate.n.xml, to run these networks. The only change is that, the Type of Datablock is changed to 'Run' from 'Train'. Also, we are not providing any OutputValues - because we expect the network to predict and write these output values. Kindly note that the network xml files (like or.xml, and.xml and xor.xml) are not undergoing any changes - because we are running the network, and not training it. Now, to run the neural network, we can invoke the nxml interpreter using the following command, in the command prompt. Again, open runGate.n.xml to see the outputs. File: runGate.n.xml after running it with nxml interpreter. Kindly see that OutputValues are predicted correctly. Now, change the Output Type from Pattern to Array, and see what happens. You will get the exact output values in comma separated decimals if there are more than one neuron in the output layer (in this case, there is only one neuron in the output layer). Pattern data type always rounds the output to 1 or 0. Now, let us see how you can create a neural network, train it and run it to detect brain tumors from the image of brain, using Neural XML. I'm just trying to make things interesting. Of course, please understand that the samples used in this illustration are not 'real' images of the brain - they are just some 'virtual' images, and is meant purely for demonstration. Assume that we have the following images, and assume that each image is an x-ray of the brain. Each image has a size of 16 x 16 = 256 pixels. We are using 13 images to train the network. According to the density of white pixels on a corner, we are assigning a value or condition (0,1,2 or 3) to each image, starting counter clockwise from the bottom left corner. The value of each image is shown below. We are using the density of white pixels on a particular corner, to detect the possibility of Brain Tumor. For example, see the first image. It has more white pixels at bottom left. Let us define the following possibilities. I.e, for example, image 1 and 2 has no problem, image 3 and 4 is some what infected, image 5 and 6 is infected, image 7 and 8 is critically infected and so on. Let us see how we can do this using Neural XML. The number of neurons in input layer. The number of neurons in output layer. Neurons in input layer - As I mentioned earlier, we are providing a 16 x 16 image as input. When we digitize this picture, we can see that there are 16 x 16=256 pixels in each image. So, let us take 256 neurons in input layer - we will feed the value of each pixel (1 for white pixel and 0 for black) to each neuron in the input layer. Neurons in output layer - We have four conditions - condition 0 (00 in binary), condition 1 (01 in binary), condition 2 (10 in binary), and condition 3 (11 in binary) - so, let us take two neurons in the output layer, because the highest output value we need (i.e, 3) requires two bits to represent it. Neurons in hidden layer - Let us blindly assume that we have one hidden layer, and it has the number of neurons equal to the neurons in the input layer. For training the neural network, let us create an nxml file, train.n.xml. All images are in the samples folder, relative to the folder where train.n.xml resides. Kindly note that, we used Image Data tag instead of Pattern Data tag. For Image Data tag, you can specify the InputFile attribute, which specifies the image. Along with the image path, you should specify the input image's width and height. If the image size is greater than this, the image will be resized to this size. For each image, we specified the OutputValue as the number corresponding to the condition we discussed earlier. Now, let us start training. For example, for Image 1, the output value we provided to train the network is zero. Once the network is trained, you can use it to check image samples. To illustrate this, let us create an nxml file to run the network. We are going to detect the following images. The run.n.xml file is given below. All files are in test folder, relative to the folder where run.n.xml resides. Please note that any of these images are not among the list of images we used for training. Now, let us run the network by issuing the following command. Now, have a look at the run.n.xml again. File: run.n.xml after executing it using nxml. You can find that the neural network wrote all the output values correctly, by detecting each image properly. That is it for now. In the mean time, have a look at my website, Amazed Saint Blogs, here at http://amazedsaint.blogspot.com/ . You can download a lot of source code and this kind of articles there, and subscribe to the news letter to get information regarding new project releases, new article releases etc. My name is Behnam, I'm 25, from Iran and I studied computer science. Artificial intelligence is my love and I am very interested in it. It was more than 3 months ago that I have the chance of finding your articles on Codeproject web site. Your article simply over excited me. I have used your materials on Neural Networks and your BrainNet library at the university for a lecture. I have mentioned the source and gave this weblog address to my classmates and the professor. They were very excited, just like me. Please continue to work on such things. By the way, I've forgot tho tell you that I am working on your Brainnet library and the handwriting recognition application to turn it into a Farsi language OCR. It is currently unable to return the results in Farsi language. Although, it can recognise the patterns very well. I am just beginning to get into this area. My interest is in using NN for refining weather forecast data. I could not get the NXML to download. Nothing happens when I click on the link. Just blank screen. Have you any information on similar applications of NN.